In the first half of the twentieth century, part of Brickell Avenue was referred to as Millionaire’s Row. There were many prominent families who made their home in this part of the avenue. While James Deering’s Vizcaya and William Jennings Bryan’s Villa Serena were considered estates, the homes on Brickell Avenue between Fifteenth and Twenty-Fifth Roads were not quite at that level. However, the homes were widely admired as fine mansions. The men and women who commissioned each of these mansions were very proud of their family homes. A lot of creativity and money went into designing and building homes that were both unique and appropriate for the location. Each home had its Revival Period adaptation that was based on architectural styles that the homeowners found interesting during their travels throughout Europe. The row of mansions in Figure 1 were just a few examples of homes found along Brickell’s Millionaire Row. The picture was taken in 1948 and this post will be one of five describing each home in the picture. The photo was taken from Biscayne Bay looking west. The homes featured in the photo were on the east side of Brickell Avenue, between the 1500 & 1600 blocks of Brickell Avenue. The first home discussed will be the one located on the far right side (or northern most), in the picture. 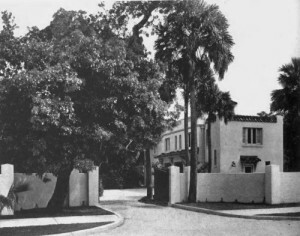 The home at 1581 Brickell Avenue was commissioned by Charles L. Briggs. Briggs ran a very successful leather manufacturing company in Haverhill, Massachusetts. He enjoyed traveling down to Miami during the winter months for a break from the cold Massachusetts winters. He was referred to as the “Shoe King” by many of his Brickell neighbors. 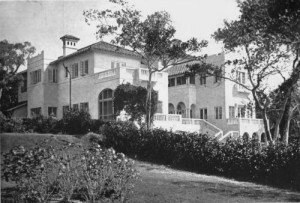 Briggs purchased the land at 1581 Brickell and hired architect Gordon Mayer to design his home in 1917. The plans for the home garnered a lot of attention after the design was revealed. The architectural design of the home conformed more toward an old English style. This style was in sharp contrast to the Spanish or Italian designs of many of the homes planned and built in the Brickell Avenue area. Briggs spared no expense when it came to the home’s amenities. It featured a dining room wing with 22 foot ceilings, a refrigeration plant, incinerator, a linen chute and an elaborate telephone system. Underground lighting around the compound, water softener system, power pump and a pressure storage tank in the garage are just a few more examples of the technological advancements built into Villa Regina. There were servant’s quarters with laundry facilities, a sea wall and elaborate landscaping throughout the grounds of the property. The front entrance featured a privacy gate and the entire grounds were surrounded by a concrete wall for privacy. The home was designed to preserve as much natural foliage as possible. Villa Regina was prominently featured in the American Architect & Architecture Magazine in 1919. 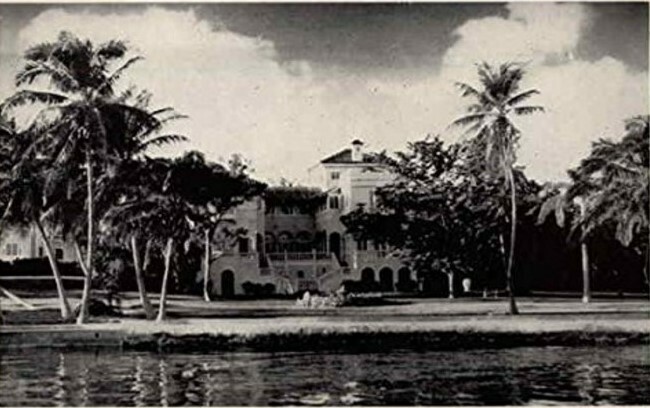 Gordon Mayer was employed not only for the Brigg’s mansion, but also for Caroline Bromwell’s home at 1564 Brickell Avenue. Through the course of his stay in Miami, Briggs got more involved with the local business community. In December of 1921, Briggs was elected Chairman of the Board of the newly formed Miami Bank and Trust. Briggs was also on other boards of banks in Boston and New York. The Miami Bank and Trust would eventually construct the Langford Building on SE First Street in downtown Miami as its corporate headquarters in the mid-1920s. Briggs and family lived in the home until the mid-1930s. Financier Foster C. Coombs lived in Villa Regina for a few years in the latter part of the 1930s. Millionaire’s Row on Brickell was also known as the upscale Little San Juan following the war and into the 1950s. One of the first successful Puerto Rican families to move into Brickell was Jacob L. Cabassa. Cabassa’s family was the first to settle on Brickell Avenue when they moved into Villa Regina in the early 1940s. Figure 2: Villa Regina in 1919. Courtesy of American Architect & Architecture. Figure 3: Villa Regina main entrance in 1919. Courtesy of American Architect & Architecture. Be the first to comment on "Brickell’s Millionaire Row – Villa Regina"